Burger King, through their insanely creative advertising agency Crispin Porter + Bogusky (see their recent Burger King perfume launch), launches a Facebook application that encourages users to remove Facebook friends. 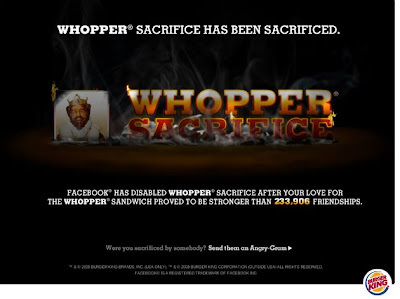 (See Whopper Sacrafice) Sacrifice ten of them and you got a free Whopper. 233,906 friends were removed by 82,771 people in less than a week.